Deluxe Wine and Gourmet Basket. Two bottles of select wines from award winning vineyards are the focus of this basket. Add your personal touch in this basket by selecting a wine option of two reds, two whites, one bottle of each, or one bottle of champagne. A variety of gourmet foods are included in the basket to enhance the flavor of the wines. Delicacies such as seasoned crackers, cheese, olives, nuts and other cocktail nibblers are artfully arranged with cookies and specialty confections in an attractive basket. A great gift for any occasion. Basket design may vary due to location and availability. 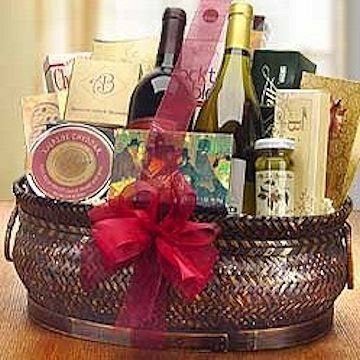 This wine basket cannot be delivered in: CT, KS, MD & PA.